The international hit party game Codenames is getting enlarged in the new Codenames XXL version. Czech Games Edition is tentatively planning to release the game in Q3. 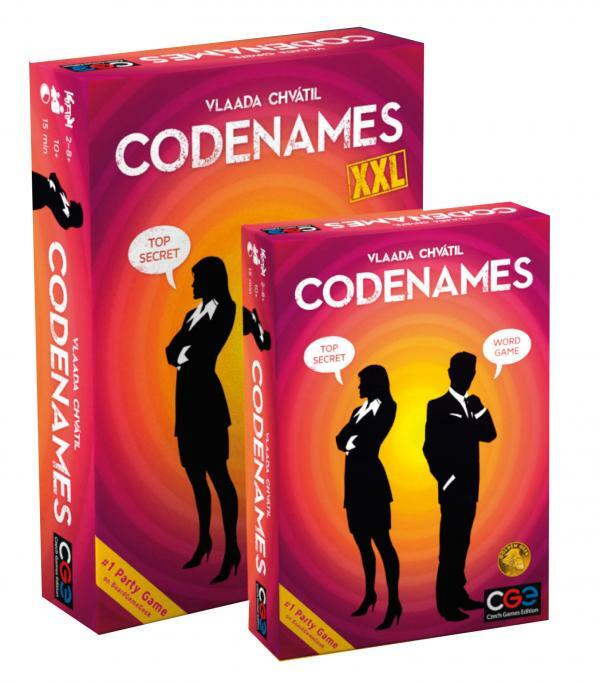 Codenames XXL is identical to the original Spiel des Jahres winning version of Vlaada Chvatil�s design except for one change: to make the game easier for large groups to play, the cards are nearly double the normal size. The larger cards will measure 4.7� by 2.8� (compared to the standard version�s 2.6 by 1.7). This is the same size as the cards in the oversized demo kits Czech Games Edition was offering to retailers last year (see �Czech Games Edition Offers �Codenames� Demo Kit�). Codenames continues to be a big hit, with a special two-player version (see ��Codenames Duet��) and a licensed version from USAopoly featuring Marvel superheroes (see ��Codenames: Marvel� Revealed�) both releasing last year.